How it’s common to think about what you can’t do in midlife instead of what you can do. How the concept “50 Unplugged” is being used to refer to “unplugging” from negative aging stereotypes so you can get excited about your life. Why falling in love with your 50s is totally possible for you. How it’s hard to ignore some weird negative thoughts about aging, even when you don’t really mind your age. How feeling “off” and “not quite yourself” in midlife can be a classic midlife funk. How you can feel “funky” about your career even when your job looks amazing on paper. Why joining the new, 50 Unplugged Mastermind just might be PERFECT for you. This week we’re talking about how common it is in midlife to think about what you CAN’T do instead of what you CAN do. 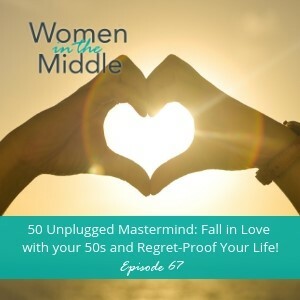 You’ll also hear about the 50 Unplugged Mastermind, an amazing new coaching program to help you fall in love with your 50s and regret-proof your life! Maybe you’re almost 50, maybe you’re in your 50s. Whatever your age, you’re probably thinking about how old you are in some way or another. You may have even noticed that you’re quite aware of your age and what it means for you…and it’s not all positive. I’ve heard this over and over again from amazing women in the middle like you. It’s certainly not a love fest out there. You’re feeling a bit off. You might not even know exactly what the problem is, but you DEFINITELY KNOW you don’t feel quite like yourself. 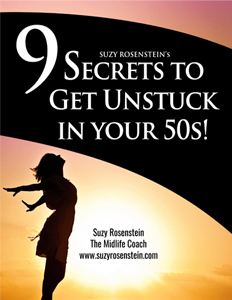 Basically, you’re in a midlife funk and feel stuck. You’re just watching your own life pass you by. You go through the motions day after day and nothing changes…especially with your job. You might even be so frustrated that you feel like you just can’t take it anymore and know you probably need to make a change. I can totally relate to this too. It happened to me as well and it was a long and frustrating phase of my life. That’s why I’m super excited to announce an exciting and fun new coaching program to help you bust out of your funk, fall in love with your 50s and regret-proof your life! The 50s Unplugged Mastermind is the perfect program for you! The 50 Unplugged Formula is unique and the backbone of the Mastermind. It’s about PRIDE, MEANING and SOUL. This step-by-step, year-long system will help you create the life you want, finally, after all these years. Scroll down for the link to apply!